A big thank you to my new favorite employee of the day – Adrienne – who just got back from a one week trip to NYC. She brought back some amazing chocolates from Vosages with flavors like Hungarian Paprika Chocolate and Anise Fennel Dark Chocolate. They were so dense and rich that none of us could eat more than one at a time. 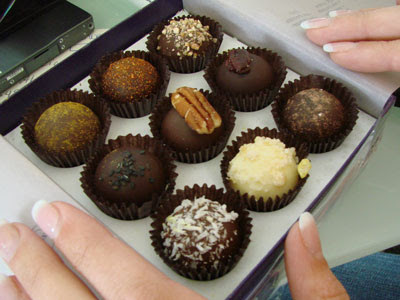 Tomorrow, I’m planning to devour the Sweet Indian Curry Powder Coconut truffle. Oh yumm, I am drooling right now over that pic. Where can I get some of these!